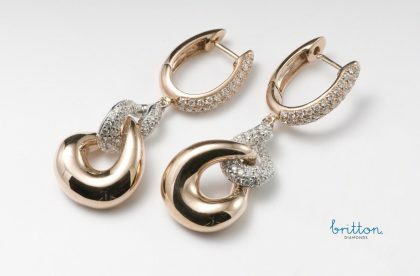 Diamond hoops set in 18K rose & white gold with two softly twisting links one completely set with diamonds connecting to a warm glow of high polish rose coloured gold. SKU: 140-00171 Categories: Diamond Earrings, Earrings. Tag: Rose Gold Diamond Drop Earrings.